The squirrels were, quite simply, frantic before our first snow; lots of last-minute gathering, storing and burying of nuts all over my back lawn. Now, after our first snows have come and gone and we’ve got bare ground again, they’re working from caches in hollows of trees along the property line that separates my land from my neighbor’s. They’re also digging out individually buried nuts that they’ve tucked a mere half-inch below the ground in my yard. I know they sniff them out all winter long—they can even find them beneath a foot or more of snow, either by smell or by some miraculous internal mapping system! And now that the leaves are down and the maples and oaks along my street are stark, I can see the drays hanging in the branches—there’s lots of squirrel real estate in my neighborhood this year. Built of twigs, leaves, grass and even dried flower stalks, these winter drays, wedged in the crotches of uppermost branches of the trees, are as much as thirty feet above ground. They look like messy humps of brown, dead leaves (nothing fancy here) but they’re wonderfully engineered: twigs and branches woven together, lined with leaves and grass and even pine needles for warmth and comfort. The entrance is on the underside (to keep out the rain and snow) facing away from the prevailing winter winds. Inside, there’s room for one or two North American grays. They prefer to live alone, but during our cold winters, they sometimes double up for warmth. There’s also a mating season in late January/early February, so having larger quarters might be an enticement—goodness knows a larger house would certainly impress me! We have a healthy community of grays here in my neighborhood. Lots of us have birdfeeders, and some of us have come to the realization that we feed more squirrels than birds—squirrels are little thieves, indeed, and professional acrobats when it comes to figuring out how to get into our feeders. I’ve seen them leap, twist, dive out of trees onto feeders, watched them hang upside down from wires and perches, even leap from roofs and fences! And when the supply of seed runs low, they’ll let you know—they’ll even sit on the back porch and screech at you to fill your feeders, those sassy little beggars! After all, we wouldn’t want the neighborhood to go to seed. I wasn’t very old, six or seven, maybe—but I have a distinct memory of sitting at my desk at the McClellan School in Portland, Maine in the early 1950s, a jar of glue (remember the glue jars with the little applicator brushes stuck to the inside of the lid?) and that white, gloppy paste we all used to eat whenever the teacher wasn’t looking. And I remember the aptly named Mrs. Little, my teacher; she was a teeny woman, but when she told you to do something, you did it—she had the power of God within that little body. ...the highlight: my name—not my nickname, but my real, formal, given first name—in alternating red and green! Now, the best part of this Christmas card is the fact that my mother saved it...buried it in the bottom of her jewelry box for me to find sixty years later. It’s amazing what a Sepia Saturday prompt can reveal! I spent some time rummaging today, thinking that I might be able to find a photo of members of my family on stairs; imagine my surprise when I found these three shots (I actually found more, but these three were the best). The first is of the Gould children of Newton Upper Falls, Massachusetts. 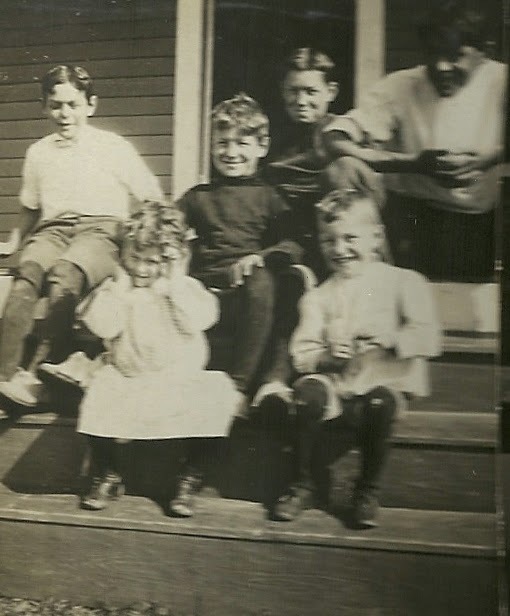 It’s a shot taken at the summer house in East Boothbay, Maine in 1900: Margaret and Howard are the youngest ones on the bottom step; the others (left to right) are Richard, Prescott, Allen and Gardner (my grandfather, who’s about 15 in this shot), the oldest. I’m not sure why Margaret is covering her ears; I just love their shiny shoes—Margaret’s with button laces. The boys all have short pants with stockings bagging at the knees, except for my grandfather, who’s old enough to be in long pants. 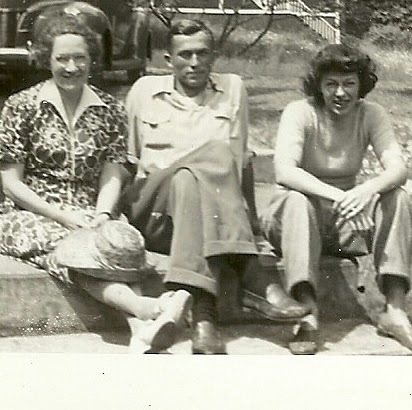 And then I found one of my father (Gardner, Jr.) sitting between his mother and his sister Shirley – again at the summer house in East Boothbay in, say, 1938-39; my father’s in baggy pants and loafers (such a fashionable look back then); his sister equally fashionable in tailored pants – just like Katherine Hepburn! 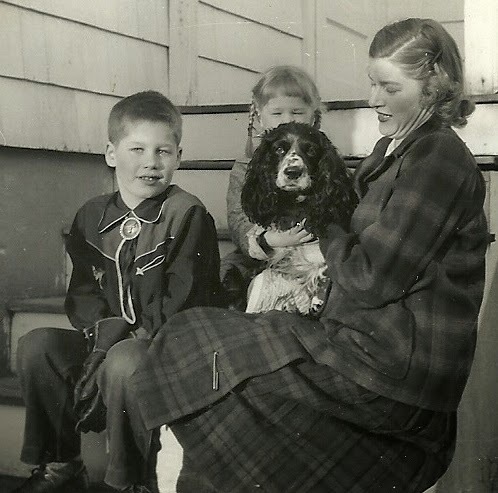 To finish the triptych, my brother, me and my mother on the back steps of my parents’ first house in Needham, Massachusetts; this is in 1950 or so. John’s all decked out in his cowboy shirt (with slide tie) and gloves; I’m in my bathrobe, recovering from the mumps! And that black-and-white cocker spaniel is Ferdinand, the wonderful dog who loved Oreos (see my post of November 23). So here we are: three generations of Goulds, the oldest born more than one hundred years ago (1886); the youngest in 1946 and still going strong in 2014 (me). Just think of all the stairs we’ve climbed! We got hammered, as we say, on Thanksgiving Eve; heavy, wet snow and high winds, which resulted in downed tree limbs and electrical outages. I pinned a blanket over the door to my living room and spent the long evening in the kitchen/dining room, keeping the temperature in there at 65 degrees (thanks to my little gas fireplace), playing solitaire by kerosene lamp. I slept in my cold guest room underneath my best down comforter, and was toasty all night. On Thanksgiving morning, I awoke to wonderland – this is the view from my back porch! Still no electricity, but my morning paper had been delivered (these are some of the people who deserve standing ovations). I boiled water on the stove and managed a cup of coffee, then sat at the table in brilliant sunshine under a strong blue sky. Read the paper. There was an editorial about Maine’s antiquated “blue laws” (old laws prohibiting business on national holidays, originally established in an effort to enforce the sabbath); the writer was defending Maine’s tradition of upholding those laws—preventing that horrible “Black Friday” shopping frenzy that overcomes most of the United States. I lowered the paper to the table, sipped coffee, thought about it. In this country, people can celebrate every holiday any way they like—they can even chose not to celebrate holidays at all—and that’s an option for which I am truly thankful. *Editorial. “Black Friday can wait! Thanksgiving is worth it.” Portland Press Herald (Portland, Maine) 27 November 2014. Print. There’s something about kids and dogs, I think, that appeals to photographers; something that speaks of the sweetness of childhood, of unconditional love. 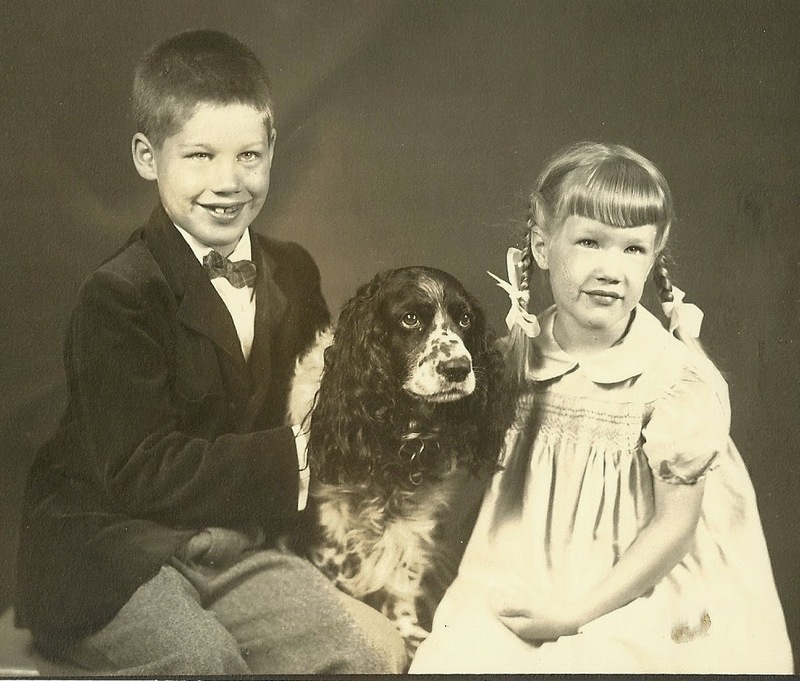 Here we are, my brother and I, with our first family dog. I don’t remember the photographer, but the backdrop suggests it was a formal affair, probably in Boston someplace in the late 1940s. His name was Ferdinand, and he belonged to my mother; he was a college graduation gift from her parents in 1941. He was named for a bull in a storybook my mother had loved—a bull who wasn’t very “bullish,” which is to say that he spent his afternoons lying down in Farmer Brown’s field sniffing the wildflowers. My father, who was a lifelong dog lover, told us that the only reason he married our mother was to get her dog—an excellent reason to marry, he said. When I was about five years old, we moved from Boston to Portland, Maine. Ferdinand came with us, of course, and settled in the neighborhood. We lived near a private school playground, and Ferd spent recess there every day, playing with the children: dodgeball, catch, tag; he was such a part of the community that the kids would knock on our back door to ask if he could come outside! Summers he spent with us at our grandparents’ summer home, near a lake at the foot of Mt. Monadnock in New Hampshire, swimming, chasing squirrels and chipmunks, sleeping in our beds. He loved car rides, walks, and Oreos. ...it was a long, long time before we ate Oreos in my house again! When I saw the Sepia Saturday prompt photo of several portly gentlemen filling their plates in a buffet line (all smiling over a buffet table groaning with delicious offerings) dressed in suit jackets, neckties and, of course, nametags, I was reminded of a wedding reception I attended years and years ago. It was one of those perfect summer days here in Maine: warm, blue skies, sunshine, slight breeze. The gathering was beneath a striped marquee pitched in a field overlooking a quiet cove; people strolled down to the reception from the road by way of a mown pathway through thousands of blooming wildflowers; everybody was in linen and silk, dribbed and drabbed in gold and silver and pearls. It was, indeed, a high affair! It was one of those “blended family” things—everybody’s parents seemed to have been married more than once, so there were ex-wives and partners, divorcees and stepfathers, half-siblings and step-siblings, an occasional stray cousin a few times removed; there were also about two hundred friends. It was a huge wedding reception! While flipping pages in my grandfather’s photograph album, I noticed a repeating theme...in six or seven photos, all taken around 1910 or so, the boys had the same kind of hat...and they all wore them with the front brim turned up. The first photo I found was of my grandfather, Gardner S. Gould, wearing his crusher. He’s got his work pants, belt, white shirt (rolled sleeves), a necktie and his crusher; he was a civil engineer and worked outside most of the time. I remember him looking like this – he was a “putterer,” and used to do small projects around the house on weekends. So, I thought, did they all wear just crushers? Or were there other styles popular back then? I jumped back into my old catalogues, and found some really amazing hats, some of them crushers. I found a “fur crusher” hat (which hasn’t a single strand of fur anyplace as far as I can see); a finer grade crusher with a narrow silk ribbon band and a “medium curl” in the brim. They’ve got stetsons: Roosevelt, Railroad, Cowboy, Idaho and Columbia Stetsons. Planter and Ranch hats, Cuban hats; Pine Ridge Scout, and Montana hats. And the sombreros! Goodness, there are Sombreros of many styles: Cowboy Sombreros, Cow Puncher Sombreros, Texas Steer Style, Mountaineer and Mexican Sombreros; Pride of the West, Texas Chief. I can’t imagine my grandfather in a sombrero, but I love looking at him (and the others) in their crushers. They all look a little goofy, if you ask me. I have a small collection of old catalogs, including several from Sears (late 1800s to 1920s) and one from Charles William Stores, a mail order company in New York; I have, too, a bunch of old magazines and newspapers, and I can find amazing details in all of them. By 1929, the choices in the Sears catalog were nearly out of hand. “We Offer the Greatest Tent Values in America” screams the banner headline on a two-page spread. Honor Bilt Umbrella Tents, in beautiful olive green color, shed water like a duck’s back. 9x11 feet for $39.95. The Highway King was Forest Green; it had a height of 6’2” at eaves, 8 feet at center pole. It also had a waterproof duck floor sewed into the bottom of the tent. $23.95. There were ventilated tents, white duck tents, play tents; bug-proof tents equipped with marquisette curtains to keep out mosquitoes; small, medium and large tents with collapsible steel center poles and stakes, awning poles; tents with eight guy ropes and rustproof tent pegs. 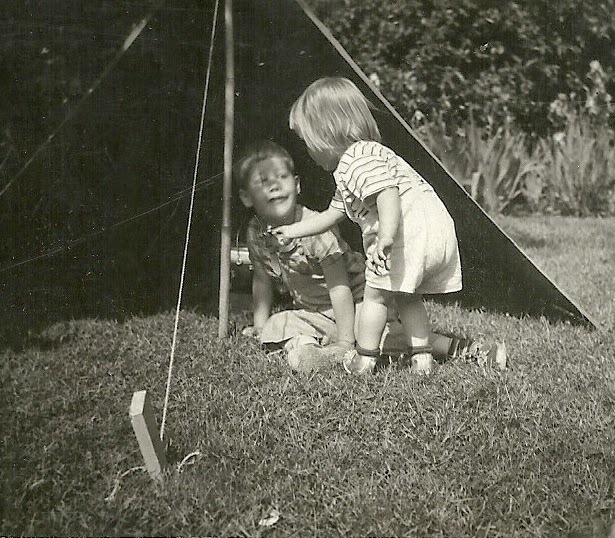 But the best of all were the “Tourists’ Tents,” popular for “week-end trips” in the family automobile. These were 7x9-foot tents with two windows and sewed-in front curtains; additional front awnings could be drawn over the top of the car (see photo) to help support the tent and, one presumes, allow for extra space in the seats of the car. $15.95. I look at that arrangement and shudder. All things considered, I think I’d rather stay at a Motel 6, thank you. 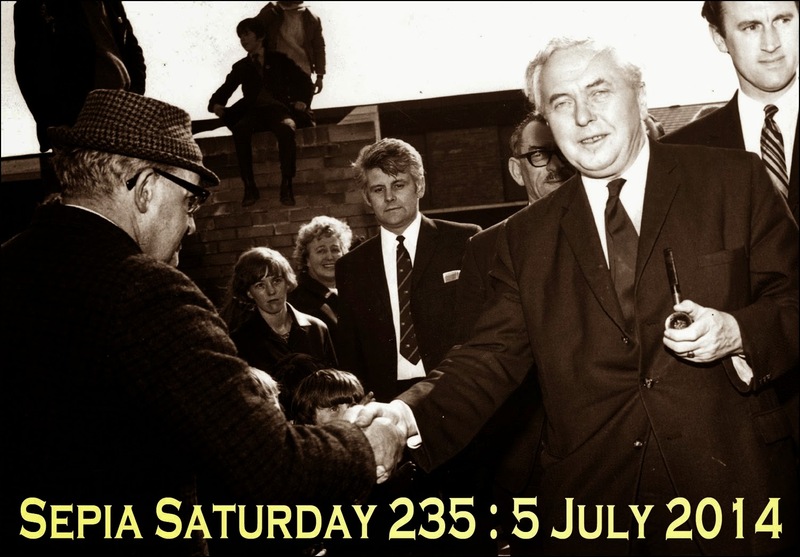 I spent a couple of days looking at the Sepia Saturday prompt – the photo of the hurdy-gurdy man and his little monkey – wondering where I’d seen it before. I knew I hadn’t, of course. But there was something familiar about it, something that just grabbed me by the neck and wouldn’t let go. I thought about it all Thursday and Friday morning while doing errands, doing laundry, cleaning house. It was something about the monkey. I went dashing up the stairs to the second floor closet where the boxes of family photos are stashed, and went to work, and found what I was looking for inside of ten minutes. This is a photograph of my grandfather’s cousin, Jessie Collins Gould, who was born in Newton, Massachusetts in 1885; she’s on the back porch of the family cottage in East Boothbay, sitting in a rocker in her white summer dress – all lace and frill – with a locket around her neck and a white hat perched jauntily on her head. ...she looks like the monkey. I’m writing a novel, one that takes place in the 19th century. It’s harder than you might think—not in a general sense, though. After all, people and rivers and oak trees and cows and brick buildings haven’t changed very much. No, the difficulty is in the detail of everyday life in the mid-1800s. There are some details that I just never thought about until now—details such as: what did people use for toilet paper? Ancient Romans, who were big on public baths and privies, used a sponge on the end of a stick (now that brings to mind some pretty funny images). It was kept in a trough of salt water that ran in front of rows of privy seats and was used over and over by goodness knows how many people...(and that’s a whole different set of images!). Richer people used wool (I get a severe rash from wool against my skin; I can’t imagine what would have happened to me if I used it as toilet paper!) and pieces of fabric. Poorer folks – those who used the great outdoors – used leaves, ferns, clumps of hay or grass. They oftentimes used streams and rivers as direct toilets, sometimes taking off their clothes or simply lifting their skirts, squatting in the rivers, then washing themselves in the river/lake/stream and redressing. In New England outhouses, our forebears had a bucket or wooden box that hung on the wall that had a collection of rags, corncobs, and loose hay – after wiping, we’d throw whatever we’d used down into the privy hole. Corn cobs were popular; also corn husks, which probably weren’t too awful when recently shucked from the cob, but when they dried out, they must have been dreadful! In the wintertime, those tough New Englanders used handfuls of snow for cleanliness; the thought of that makes my toes curl. Later on (or whenever a family ran out of corncobs and hay), pages from catalogs were a popular solution; you could read your Sears catalog while doing your business, then crumple up the page and wipe with it. Somewhere, I read that rich earls and lords in England used pages from real books – none of that low-class catalog paper in those privies! Some of my cousin’s ancestors were ship captains out of Boothbay Harbor, and they had coils of old halyards and other lines from their schooners. They’d cut the ropes into small pieces and fray the strands, then make a loose ball of threads and use that for wiping, throw it overboard. But then, in the late 1860s, a trio of innovative brothers named Scott (think of today’s Scott Paper Company) began to manufacture packaged toilet paper—first as individual sheets, then on rolls. Perforated rolls came along in the 1870s, and by the end of the century, companies such as Sears, Montgomery Ward, Charles Williams Stores and others were all marketing toilet papers in their catalogs: toilet paper of extra-quality, silk velvet; soft, firm perforated papers with fascinating names – Japps Tissue, Manhattan White Crepe Tissue, White Rose, Snow White Crepe, Nippon Crepe, and Watersmeet Crepe Tissue. So, the next time you find yourself in the bathroom (john, loo, jake, outhouse, biffy, latrine, W.C., gong, head, privy, necessary or throne room) please give silent thanks to those Scott brothers, the first commercial makers of soothing papers for us all! Lucius Wilder Sabin played cornet in a Navy band; he served for years on the Richmond, a wooden steam sloop, flagship of the Asiatic Fleet. Between 1879-1881, the Richmond cruised through the ports of China, Japan and the Philippines, and the men played various concerts throughout the area. Lute wrote many letters home to his family in Boston...I’ve transcribed most of them, and am fascinated by his descriptions of Shanghai—his reports of playing in the Public Gardens, at Grand Dinners, at private residences of notables in the city during that time. I promised to write to you again and I will do so now. I was very glad to get your letter sometime ago and I said I would answer it right off but I have waited a long time. ...and so this morning, after breakfast and numerous cups of coffee, I hopped into my Yaris and headed north to the town of Windsor, a small town near Maine’s capital city of Augusta. After the rush and roar of Augusta, it’s absolute heaven to roll along the side roads of Windsor, past the fairgrounds and the church, past fields and woodlots. Hussey’s General Store in Windsor is, I am sure, a state landmark – a general store that sits at a crossroads in rural Maine. Tourists make the trip here just to photograph this sign. ...and, of course, guns and wedding gowns and cold beer. I mean, look at the jaws on that man! I’ve been looking at jaws a lot lately, especially after these past few months; it’s incredible how we take our jaws for granted! Last March, after a few weeks of severe pain in my lower right teeth, my dentist took a panoramic x-ray of my face—one that started just below my eyeballs and ended below my chin—and he saw a shadow. It was long, set deep in my mandible; it was below my teeth and partially in my jawbone. “What the hell is that?” I whispered. I had a biopsy: the oral surgeon punched a hole in my jawbone, went in, cleaned out the area as best he could; sent a sample to a laboratory near Boston. I relaxed a bit—the surgeon wasn’t too concerned. I started taking an antibiotic, lived through several painful days of stitches in my mouth (and another course of antibiotics when it became infected). On the tenth day, my phone rang. I was diagnosed with an odontogenic tumor—a tumor caused by a rogue toothbud. People say that life changes in an instant, and I now know exactly what that means; I was terrified. I had surgery in mid-May. They took my lower right teeth, went in through the top of my jaw and inserted an irrigation port that sits on my gumline, then wired it to my other teeth for stability. And my job is to irrigate twice a day...the tumor will shrink and my jaw will begin to replace bone that the tumor has destroyed; in about a year, they’ll go back in, remove the smaller tumor and freeze the lining of the cavity. It happens every year in New England. We all get a little edgy up here in the spring when the winter snowmelt raises the water levels in our streams and rivers; if we’ve had a particularly cold and snowy season, we get positively squirrely—the combination of snowmelt and ice jams means one thing to us. One way to ease the situation is to send Coast Guard icebreakers up the rivers to break up winter ice in the main channels. As of today, the Thunder Bay and the Tackle have already started working their way up the Kennebec River from Bath on the coast all the way up to the City of Gardiner, and the open access reduces the chance of flooding. It’s a sure sign of spring up here, and we’re all delighted! Memorable flood years for the Kennebec include 1826, 1870, 1896 and 1987, when the river rose 34 ft. above normal. I remember floating around in an old canoe in the parking lot of the local grocery store (which is around the corner from this street) during that flood. There was a tiny liquor store in the same area; all the windows in the store broke, and set free hundreds of bottles of hooch—a rowboat full of guys armed with fishing nets had a wonderful time dipping for fifths of whiskey that bobbed in the floodwaters, although I remember more drinking than dipping. The ones they didn’t net went out with the tide and the floodwaters! The photograph was taken in Gardiner, Maine on March 14, 1936 (photo courtesy of Gardiner Public Library). Some of the old timers used to tell stories about how everybody rushed downtown to help the merchants move their stock from the basements and first floors up to the higher levels whenever flood warnings were issued. The Kennebec River flows just behind this row of storefronts, the Johnson Opera House sign is hanging off a building on the opposite side of the street. Most of the buildings in this photo are still standing; the old multi-windowed shoe factory in the background, though, is long gone. It was the first book I ever owned; I’m pretty certain that every child in my family received a copy of Robert McCloskey’s Make Way for Ducklings, first published in 1941. After all, we’re Boston born and/or bred...we’ve got tattered and torn copies in hardcover, softcover; we’ve got them in bookcases, attics and bedrooms. It’s right up there with the family Bible. Make Way for Ducklings is the story of a pair of ducks (Mr. and Mrs. Mallard, of course – who needs anything more sophisticated than that?) who search the Boston area for a proper place to raise a family. After an overnight rest in the Public Garden, where they encounter a one of the city’s famous swan boats (they think it’s a big bird) and have a close call with a kid on a bicycle, they set up housekeeping on an island in the Charles River. After their ducklings are born, Mr. Mallard takes off to explore the area, leaving Mrs. at home with the children (don’t get me started on that! ); they agree to meet up again in the Public Garden in one week. While the Mister has a grand time investigating other parts of the river, Mrs. Mallard is left to teach their children all they need to know about being ducks: how to swim, dive for food, walk in a line, etc. One week later, Mrs. Mallard leads her ducklings off the island and across the highway (what is now Storrow Drive -- a major artery in/out of the city proper) on her way to the Public Garden to meet Mr. Mallard. A local policeman stops traffic for her; pedestrians admire her family as she struts down the sidewalks. There’s a squad car at Beacon Street; four policemen halt the traffic to ensure safe crossing there, and, finally, Mrs. Mallard and the ducklings are reunited with Mr. Mallard in the lagoon in the Boston Public Garden. They live, of course, happily ever after. In 1987, a bronze statue of Mrs. Mallard and her eight ducklings was installed in a walkway made of old Boston cobblestone. 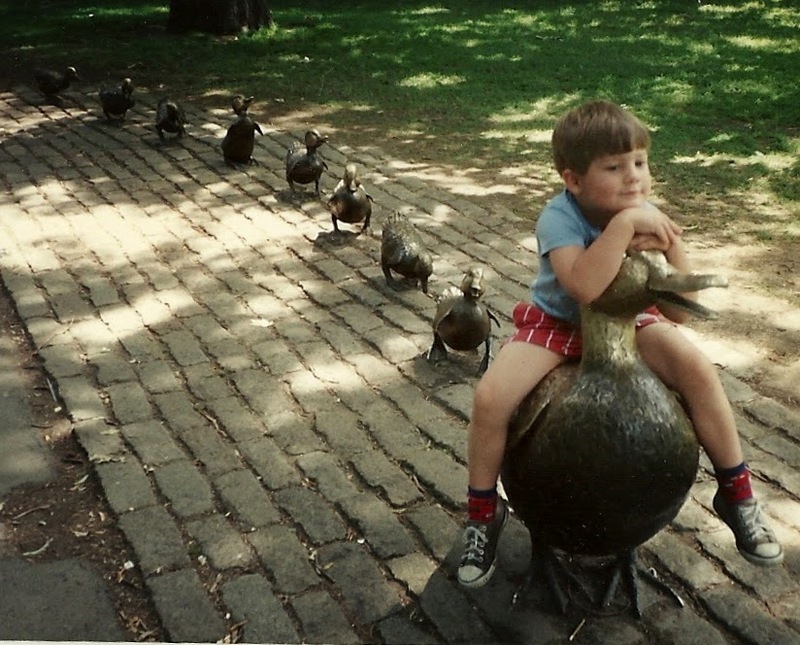 In 1989, my nephew visited; here he is, atop Mrs. Mallard, with Jack, Kack, Lack, Mack, Nack, Ouak, Pack and Quack trailing along behind! I’m halfway through my second novel, a work of historical fiction that covers two generations of a group of families that lived in rural Maine between 1820 and, roughly, 1920. One of the hardest parts of writing historical fiction is shifting perspectives, moving back to an earlier time and looking at things the way people did back then—you can’t write convincingly about the early 1900s when you’re busy with a 2014 mindset. So I comb flea markets for things that will help me make that trip back in time; one of the greatest sources for me is books—not old, dry history books about dates and battles and land acquisitions, etc. ; they’re pretty useless to me. I look instead for books written during the time period, books my characters might read themselves. I take them home and read them, cover to cover: agricultural census books, town reports and old school textbooks; novels, newspapers; books about farm buildings, breeding and veterinary practices; cookbooks. This one, Household Discoveries, is a gem. It was published in 1908 in New York by the Success Company, publishers of “Success Magazine,” and has more than five hundred pages of household tips, suggestions, recipes and common sense. Here’s how to use brick dust and/or kerosene to scour knives; clean black goods (mourning clothes) with alcohol and water; how to get dirt (“matter which is out of place”) from clothes, barrels, harness and tools; how to fasten a bag for waste thread to your sewing table. You can decorate your home—all rooms. There’s a section on lighting (only one electric lamp in the bunch); beds and mattresses and pillows; how to set up the furniture in your parlor. Have a problem with rats? Ahh! Simply mix a dough of phosphorous paste (lard, phosphorus and alcohol) with corn meal, oatmeal of flour and sugar, add a few drops of aniseed. Place pieces of this dough in rat runways. It’s got sections devoted to soap, washing, ironing, sewing; paints and varnishes, garden pests, metal work, cleaning of tools and harness; weights and measures, preservation of fruits and vegetables; a couple of chapters on manners, health and hygiene. Honestly, it says that, right on page 484. It’s enough to keep me here in 2014. It’s one of my favorite books: The Scholar’s Arithmetic; or, Federal Accountant, by Daniel Adams, M.B., published in 1817. It’s hardcover, leather-bound. The corners are rounded, battered, there’s scratching in the cover leathers and stains on most of the pages, but, still, it’s one of my favorites. How tough can that be? I thought, thumbing through the chapters. It starts out easy enough: simple addition, subtraction, multiplication and division...the first forty-odd pages I can handle with ease, but in Section II, things get tricky. Single Rule of Three, Double Rule of Three. Huh? I haven’t a clue. Do what? I thought; it has something to do with reducing pounds, shillings, pence, etc. into farthings. Or changing moidores into shillings and then dollars. Table for Reducing the Currencies of the Several United States to Federal Money, which has columns for New Hampshire, Massachusetts, Rhode Island, Connecticut and Virginia to New-York and North Carolina currency. From shillings, pence and farthings to dollars, cents and mills. 1. How many steps of 2 feet 5 inches each, will it require a man to take, travelling from Leominster to Boston, it being 43 miles? 2. A wall is 36 feet high, and a ditch before it is 27 feet wide; what is the length of a ladder, that will reach to the top of the wall from the opposite side of the ditch? 3. A man died leaving 3 sons, to whom he bequeathed his estate in the following manner, viz. to the eldest he gave 184 dollars, to the second 155 dollars, and to the third 96 dollars; but when his debts were paid, there were but 184 dollars left; What is each one’s proportion of his estate? 4. If the height of a room painted by 12ft. 4in. and the compass 84ft. 11in. How many square yards does it contain? 5. What must I give for 3Cwt. 2qrs. 13lb. of cheese at 7 cts. per lb.? A countryman having a Fox, a Goose, and a peck of corn, in his journey, came to a river, where it so happened that he could carry but one over at a time. Now as no two were to be left together that might destroy each other; so he was at his wits end how to dispose of them; for, says he, tho’ the corn can’t eat the goose, nor the goose eat the fox; yet the fox can eat the goose, and the goose eat the corn. The question is, how he must carry them over that they may not devour each other? Definitely “diverting,” but I’m not so sure about the “pleasing” part. Send your answers by posting a comment – I’ll let you know how you fare! And, by the way, good luck. Here he is, looking like the Man of the Year. He’s just out of high school – the public high school in Newton, Massachusetts – and is about to start his engineering course at the Massachusetts Institute of Technology. This was my father’s favorite photograph of his father, Gardner Sabin Gould, who, as a little boy, apparently spent lots of time at the fire station just down the street. Tom was the lead horse that hauled one of the Newton Fire Department’s water tankers, and my grandfather was entranced. He had a hobby horse – a horse head on a broom stick – and he spent hours nickering and neighing and trotting all around the back yard of the house on Boylston Street, pretending to be Tom, the horse. The nickname stuck; my grandfather was known as “Tom” all his life to family and friends (except for my grandmother, who called him nothing but Gardner). At any rate, here he is. 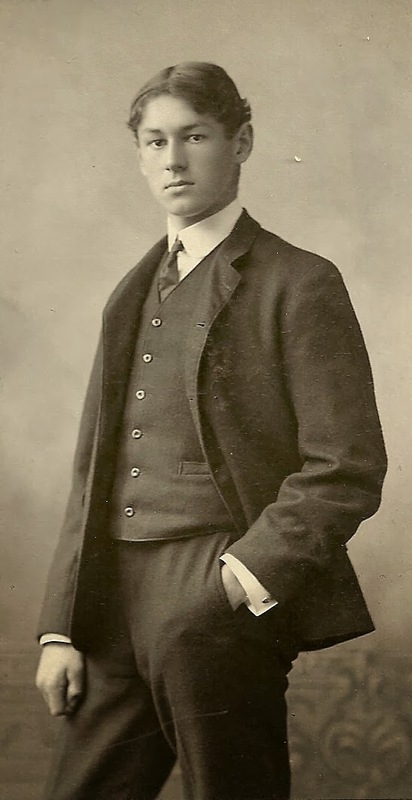 Three-piece suit (notice the rounded bottom of his vest – not the notched, pointed style); stiff collar, cuffs (and cufflinks, of course); necktie. The vest has a watch pocket – but there’s no watch yet: that came at his MIT graduation in 1910. One of his most memorable jobs as a civil engineer was the building and installation of the portico that sits over Plymouth Rock – I have a framed certificate that his crew presented to him – sixty-odd signatures beneath a hand-written citation. And he was a masterful cribbage player! He taught us all to play (I think it was the first card game I ever learned); I remember family gatherings involving cribbage games: single-elimination, multi-generational tournaments that went on for hours after dinner; much laughter and cheering, lots of encouragement. My mother played every time, even though she hadn’t the faintest idea how to play the game – my grandfather said he admired her for her willingness to participate in such a long-standing tradition! We’ve just had another storm up here in New England – a Thursday night/Friday morning whopper that blasted up from the south and dropped nine or so inches on coastal Maine. The plows were out in force; salt and sand trucks lumbered along my street all night long, clearing snow as fast as it came down. Back in the 1800s and early 1900s, they didn’t plow at all. Instead, they rolled the streets in town – used gigantic wooden rollers pulled by double teams of horses – to pack the snow down on the streets so sleighs could glide more easily on the surface. Some people had a wheeled vehicle for the spring, summer and fall months, and a sleigh for the winter. Others, especially farmers in rural New England, lifted the wagon bodies from the wheels and axles and deposited them on bobs and runners, eliminating the need for two complete vehicles. But there was a problem: sleighs were silent, swift; horses hooves were muffled in the snow; pedestrians and other drivers were oftentimes unaware of oncoming traffic, especially from the side streets or, interestingly, at night, in an era when there were no streetlights. They needed some kind of warning system – and that’s why they had sleigh bells! Some cities and towns actually passed safety ordinances requiring bells; the noise at “rush hour” must have been something! The bells at the top are all that’s left of a set that belonged to my great-grandfather – one of a pair of simple shaft bells that attached to the shafts of the sleigh. Others were loose bells, body strap bells, riveted to harness leather; there were different tones and weights. Catalogues listed nickel plated steel gong shaft chimes; harmonized Swiss pole chimes; six-bell graduated chimes, etc. Some strap bells wrapped around the horse, some were mounted around the neck or over the shoulders, others attached to the shafts or collars. “...a concentrating pianist, an enthusiastic observer...” Alan wrote beneath his weekly prompt. Goodness, I thought I’ve got that covered! I immediately went on my Sepia Search: up the stairs, into the big storage space under the eaves, hauling cardboard boxes out into the light and pawing through them like a madwoman, looking for this specific photo – funny how we Sepians know exactly what we’re looking for sometimes! 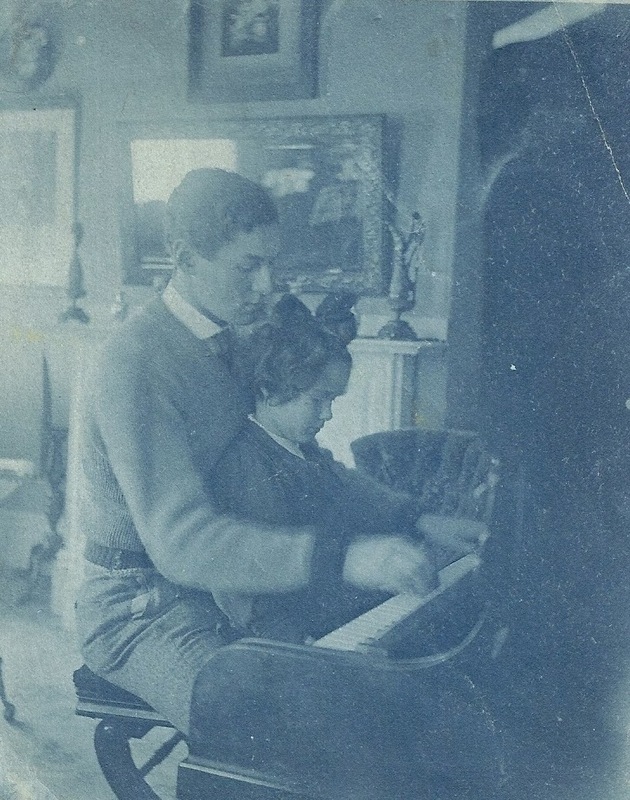 This is a cyanotype of my grandfather, Gardner S. Gould (1886) and his youngest sibling, Margaret (1899) in the living room at the family home on Boylston Street, just outside Boston. They were the oldest and youngest of six children, a thirteen-year spread between them; this was taken in 1903 or 1904, I’m guessing. I love the big bow in her hair, the look of fascination on her face. And I like the detail here: his sweater and belt, the fact that he’s wearing a necktie, his white collar, the slight blur of his right hand over the keys. And how she’s tucked up against his chest, safe and secure; her lovely, lovely profile. I have a vague recollection of the mirror over the mantel (it might have been in my grandparents’ home when I was young) and the tilt-top table to the left of the fireplace, but I have no idea whatever happened to the piano, the stool, the rest of the rather imposing artwork, the other stuff in the room. They had a special relationship, these two. Not too many years after this photo was taken, Margaret, in her nightgown, ventured too near this same living room fireplace; her gown caught fire, and she was quite badly burned on her legs. Skin grafting was quite new then, but my grandfather was willing: doctors took strips of skin from his thighs, grafted them onto hers. All went well; the grafts took, and she was home in about two weeks. Every time I look at this photograph, I smile; I can almost hear the music! This small trunk – the precursor of a suitcase, if you will – belonged to Miss Rebecca Gay, born in 1789, daughter of Calvin and Joanna Kingsbury Gay of Walpole, Massachusetts. It’s a gorgeous old thing (it’s slightly more than two hundred years old now) and it lives in my downstairs guest room. It has a rounded top, hobnailed decoration on the lid, including the initials RG; the whole thing is just over two feet long, a foot wide and ten inches deep, and it’s full of old letters, diaries, photographs and other odds and ends. Rebecca lined the interior of her trunk with newspaper – there are cuttings from the Dedham, MA Norfolk Repository, a weekly publication in the early 1800s. Inside the lid, there’s a “programme” of “Exercises of Exhibition” from Day’s Academy, Wrentham, MA from September 15, 1809; Rebecca’s younger brother Ebenezer appears in two of these exercises: The Weathercock, a Dialogue with seven of his male classmates, and, at the very end of the exhibition, another – Mrs. Wiggins, a Dialogue with the same cast and crew. Ebenezer ended up at Harvard; he became a minister, a real Bible-thumper, my grandfather said. Somewhere I’ve got a cabinet photo of him, taken in the 1880s when he was in his 90s; he’s the stuff of nightmares – long, stringy white beard, dangly mustaches, and straggly hair that droops over his shoulders. The other piece of artwork pasted on the inside of the lid is a Love Knot. It’s a complicated, interwoven pattern (for a quilt, maybe) and has romantic notions written throughout: true love is a precious treasure reads one; entwining arms sharing kisses true love blisses proclaims another. At the bottom, she signed her name – Rebecca Gay – in the lower right she wrote Drawn July 12, 1809. John and Rebecca were my fourth great-grandparents; in the bottom of this trunk is a photograph of their Massachusetts homestead and his original diary. I’ve got an old trunk in my guestroom. It's small -- a trunk for a lady -- and it belonged to an ancestor of mine; it’s come to me through six generations. It’s a small traveling trunk, hobnailed on the top (initials RG) and lined with flowered paper; it’s full of old letters, handbills, diaries, letters and photographs, etc. from both sides of my family. Buried in this ladies’ trunk is a tiny envelope, stuffed with calling cards, all saved by Roxanna Adams, my great-great grandmother, who lived in Ashburnham, MA before the Civil War. She was born on July 25, 1832, the daughter of Milton and Esther Gibson Adams. She had a rough start: her mother died when she was a year old; her father, being a “man of spirits” (now there’s a euphemism for you), unceremoniously dumped her off at the poor farm. She was, happily, retrieved by neighbors, Prescott Wilder and his wife, who took her in and raised her as their own. By the time she was fifteen, she had added Wilder as her middle name; we’ve had Prescotts and Wilders in our family in every generation since! These friendship calling cards were very popular among the younger set in the early- to mid-1800s. They were etched, printed in great quantity (one company was Dickson in Boston); young men and women purchased them in lots or individually. One of Roxanna’s diaries mentions “card parties,” where young people spent an afternoon or evening around somebody’s dining table, hand-coloring their cards (watercolors, mostly); they gave them to each other as remembrance cards. Some were of a more congratulatory nature, others were exchanged as tokens of friendship; still others were intended to show romantic interest. I’ve got cards from Melinda Willard and James M. Harris, both of Fitchburg; Nelson Whitney, Frances Maria Partridge, and a particular Lucius Henry Sabin, of Ashburnham. One of my favorites is this last one: “May I See You Home!” This card was usually presented to a young lady by a gentleman with romantic intentions; at some point during an evening, he would hand this card to her. Whoever he was, he didn’t conquer Roxanna – she was escorted home by Lucius Henry Sabin instead; they married in 1851. "NO NEED OF DOING ANY WORRYING..."
Prescott, Sergt. in the Massachusetts Cavalry. The Goulds had a “Sons in Service” flag hanging in their window at 1206 Boylston Street; red border, white field and four blue stars – one for each son in active service. Almost all of them came home. Prescott Wilder Gould was born in 1894 in Newton Upper Falls. He attended grammar and high school in Newton, then Massachusetts Institute of Technology. He played ice hockey in school, succeeding his brothers, who had made a name for themselves as the well-known “Gould trio” (Gardner, Richard and Allen) on the varsity hockey teams of both Newton High and MIT. He enlisted with Co. C of the First Cavalry (Massachusetts), going with them to the Mexican border to chase down the infamous Pancho Villa; his brother Allen, in Ohio’s Cavalry, was also there – the brothers managed to meet up in El Paso! Company C later merged with the Machine Gun Battalion; Prescott was shipped overseas to France in September, 1917. The Goulds were all prolific letter-writers. Family members at 1206 wrote daily to their sons/brothers in uniform, and the boys wrote back as frequently as they could. Prescott was buried in Grave 15 of Plot B, Row 8 at St-Mihiel American Cemetery in Thiaucourt, France; his mother, Frances Sabin Gould, visited his grave as a Gold Star mother in the 1930s. Sergt. Co. C. 102nd M.G.B.